A glass dome houses the survivors of the Switch, the period when oxygen levels plunged and the green world withered. A state lottery meant a lucky few won safety, while the rest suffocated in the thin air. Now Alina, Quinn, and Bea are leaving the dome, walking straight into the heart of danger. They have only two days’ worth of oxygen in their tanks. What will happen on the third day? Breathe by Sarah Crossan is a book that immediately grabs your attention with its unique, terrifying premise – what if the trees were gone? How would humanity survive, and would we be able to right our wrongs? 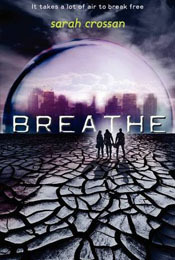 Breathe takes the basic, learned-early knowledge that trees provide oxygen to a whole new post-apocalyptic level. Told through three points of view, the reader goes on a journey outside of the Pod (the domed city where the population who survived now live) and into the harsh landscape that our world has become. There are conspiracies, plots, battles and rebellion to be had. Our three characters are Quinn (privileged son of a high government official), Bea (low-class, best friends with Quinn), and Alina (low-class, member of the rebellion). Through them we experience all aspects of life in the Pod and slowly learn the truth about the company Breathe and how/why they are running the Pod the way they are. The action and mystery start immediately and continue right up to the end of the story, and revelations come hard and fast for some of the characters. The outside world is bleak and Sarah Crossan does an amazing job with description and detail. The two leaders of the opposing factions in Breathe – the Pod Minsters and Petra, leader of the rebels – could not be more opposite. I found the Pod Minster to be a bit of a joke, and can’t help wondering what it is that keeps him in power – he’s drunk on both booze and power and I’m hoping his rise to power and continued rule is explained in the next book. And Petra I found incredibly intense to the point of harshness and brutality. The action scenes are very well done and Quinn has to make some tough choices in the end in regards to his loyalty to his father and family, or his sense of right from wrong (and what he would do for Bea, too). There was a moment of disbelief regarding the character of Jazz near the end (if you’ve read the book, or decide to read it, you’ll understand) that threw me out of the story for a bit, but other awesome elements to the story made up for it. Breathe by Sarah Crossan is an entertaining and interesting book that will keep you reading from cover to cover. With relateable and well developed characters, no love triangle (at least not yet, and I hope never!) but a sweet friends-to-couple romance, and a disturbing concept for a dystopian/post-apocalyptic world Breathe is a very well done debut. Moments in the story will have you trying to catch your breath along with the characters, and wondering how everything will work out in the end when things seem so lost. Well worth the read! ARC received at Book Expo America through author signing.